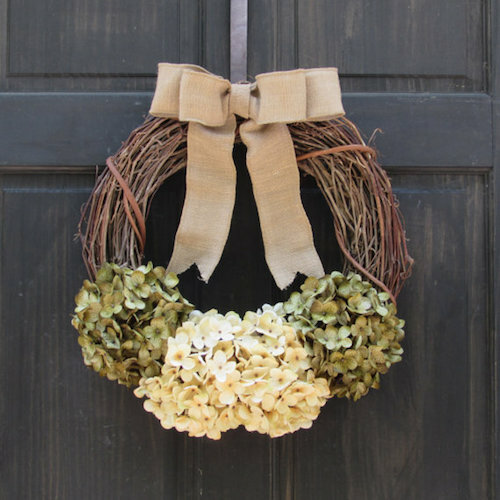 Looking to decorate this season with a Thanksgiving grapevine wreath? Nothing delights the senses like natural elements. Mother Nature always has a way of making us feel inspired and wowed at the same time. 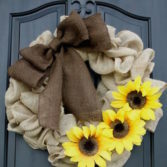 If your love for fall elements knows no bounds, you will enjoy making this grapevine wreath. The instructions are simple so you won’t have a hard time even if you are an amateur. 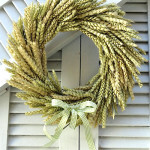 Even if you’ve never made a wreath in your life, you’ll find the process easy. 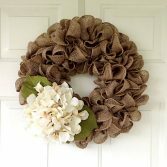 Don’t forget we have a Thanksgiving wreath category to search through too! To watch the grapevine wreath video click here. Make the wreath base by twisting loose grapevines into a circle. Cut the ends of any wayward vines or tuck them into other vines. Continue twisting and tucking until you make a nice circle. Cut off some small branches of bittersweet berries and tuck them into the vines. Use floral wire to secure the stems to the wreath. Add the eucalyptus branches. Place them in between the vines and secure them with wire. Place the thistle flowers over the eucalyptus inside the floral wire. Arrange the adornments on one half of the wreath and leave the other half bare. Tuck the elderberries in the wreath. Add the dried hydrangea. Be careful when handling the flowers as they are delicate and can easily fall off. Add a few kumquats and secure them with the floral wire. Add more fruits and flowers to fill the wreath. Hang your wreath on the window, front door, hallway, or fireplace. When making your wreath, ensure you work on a flat surface. After you are done, you can hang it wherever you want. When you work on an even surface, you can see where to add flowers, leaves, ribbons, and other elements. 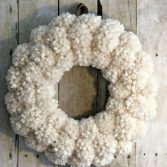 This grapevine wreath will make a statement wherever it is placed. 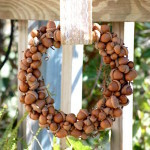 It is rustic and can stay up all season. No doubt about it, it will be the envy of all who see it. 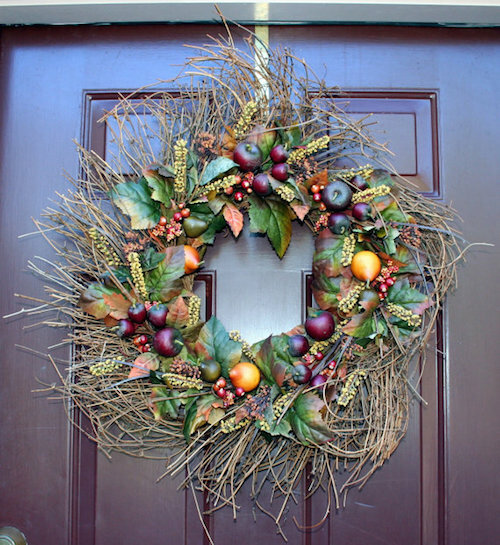 What type of Thanksgiving wreath will you make this season? 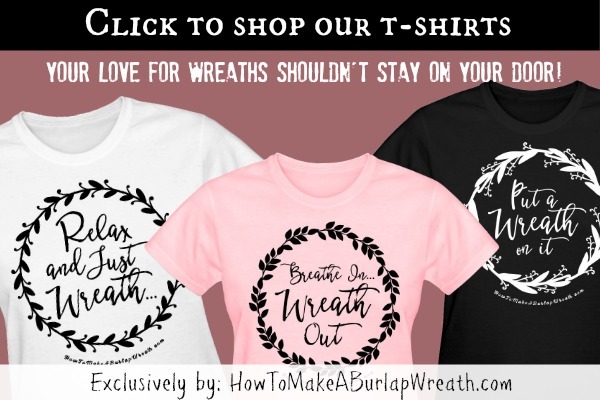 I love all the beautiful wreaths. I just got done making a Christmas wreath for a coworker. It was white and blue and all that glitter got everywhere. I believe that I like your natural wreaths so much better. Thanks for the video! I wish I hadn’t already cut back my grapevines and made something else with them this year. Pinning for next year. Thanks for sharing on the #HomeMattersParty . I hope you will join us again after the break. Thanks Dara! We love it too! Beautiful wreath, plus I see more here. Love the look of it! Even though it is messy to make, it is so worth it. Thanks for sharing your lovely wreath. I would love if you shared this with our readers at Dishing It & Digging It. The party is live now. 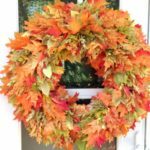 This is such a beautiful Thanksgiving and Fall seasonal wreath. Thank you for sharing your blog post with us at the #HomeMattersParty this week. Hope to see you link up again when the party opens on Friday at midnight EST!